He was active in Barcelona around 1455 and in Lerida around 1460. He is also mentioned in records dated 1479, but the date of this particular painting has been erased by time. His pictures display a felicitous blend of Flemish and Italian influences. 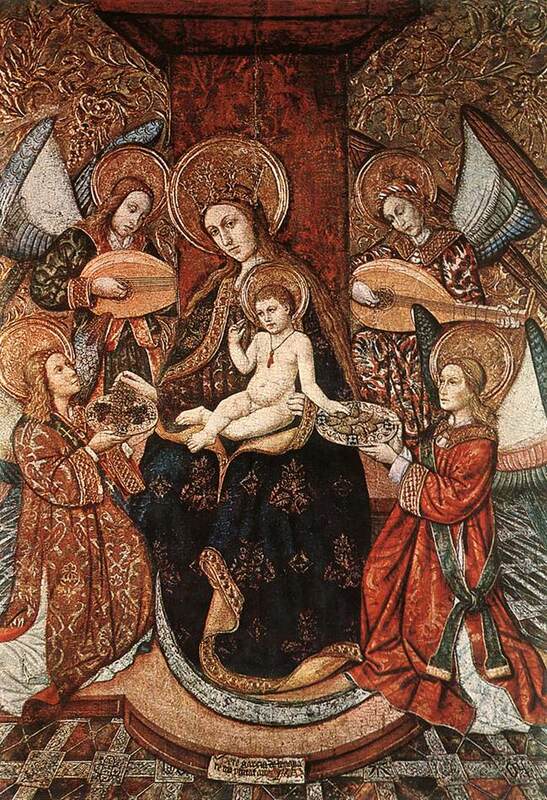 His Madonna with Music-Making Angels is a worthy successor of Pere Serra's composition of similar theme which, in Pere Garcia's time, was the central panel of the altar in Tortosa Cathedral. Representations of the Virgin and Child in the company of music-making angels were very popular at that time; in these two paintings even the fabric of the garments and the shape of the seat of the throne were similar. In 15th-century pictures the artist frequently introduced an area of floor with an ornate, chequered pattern, for this gave him a chance to show his craftsmanship. In paintings by the less talented artists the floor was usually depicted as if viewed from above but in Pere Garcia's picture we can already perceive the Flemish influence at work; the painting reveals a degree of proficiency in the application of central perspective - a knowledge gained from Dalmau.